Growing up, my best friend’s name was Hanna. We met in elementary school and after realizing we lived in the same neighborhood, began meeting up after school to roller blade. I had no idea at the time that we would become the friends we are today. Between our rollerblading days and now, we’ve had adventures I know I will tell stories of when I’m older. I’ll talk about the night we got completely lost in London after the Tube closed down or the day we jumped out of a plane 13,000 feet in the air. We were always open to a new adventure. 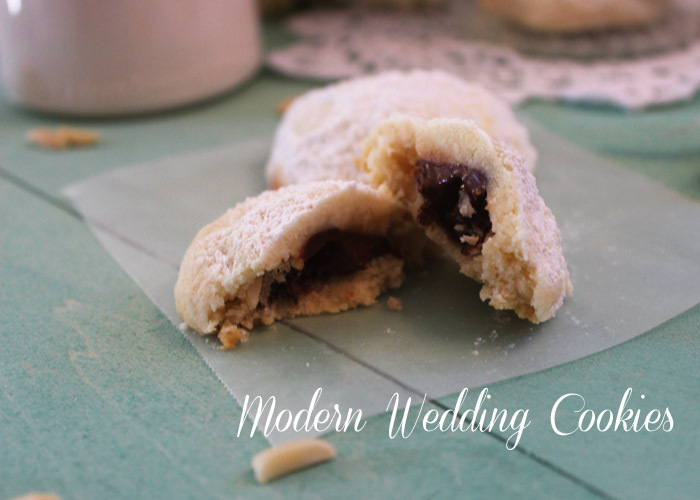 These buttery almond cookies with a chocolate center surprise are my updated version of the Greek celebration cookies known as Kourambiedes and made for my beautiful friend, Hanna and her next adventure in life. Beat butter, granulated sugar and vanilla extract together until fluffy. Add flour and chopped almonds. Combine ingredients with hands or a mixer on lowest speed until well blended. Using about 1 1/2 tablespoons of dough per cookie, wrap the dough around each chocolate and roll in hands to form a smooth ball. Place on ungreased cookie sheet. 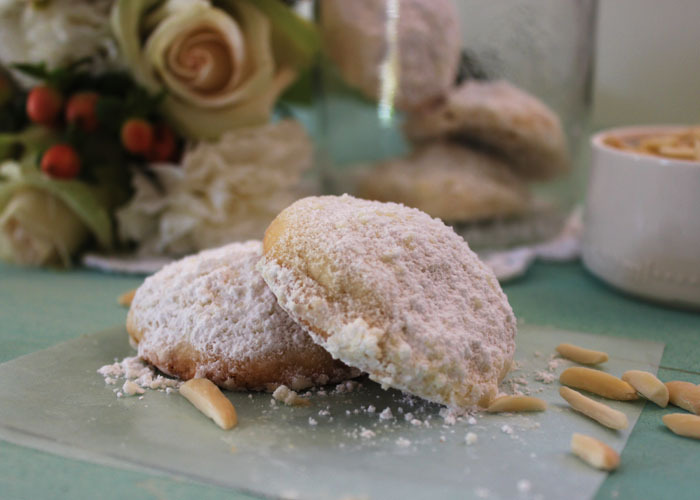 Use sifter or a small strainer to dust cookies with powdered sugar while still warm. Allow to cool completely before serving and store in an airtight container to keep fresh. What a wonderful idea, Sophia!!! How can you go wrong with chocolate and almonds!!!! I can’t wait to try the “modern” version of Kourambiedes!!! Keep up the good work! What a wonderful idea, Sophia! How can you go wrong with chocolate and almonds!! I can’t wait to try this modern version of Kourambiedes! Keep up the good work!! Thank you Constance! Let me know how they turn out! !